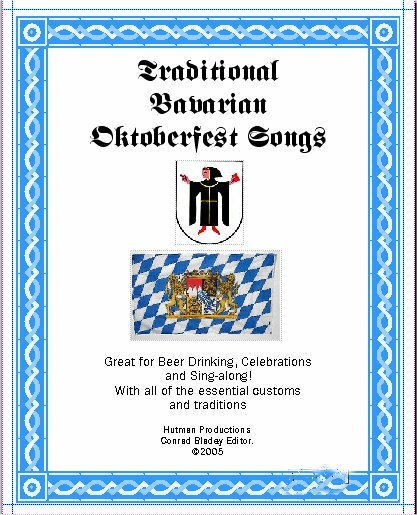 This booklet or hymnal of Oktoberfest Songs is designed to help those interested in the customs of Oktoberfest to renew the famous songs and customs. Rosamunde, Hoch auf dem gelben Wagen ,Wer soll das bezahlen. Ach, du lieber Augustin.Grad’ aus dem Wirtshaus. Hab’ ich einen Durst.Trink'n wir noch ein Tröpfchen, Der fröhliche Wanderer.The Star Spangled Banner (in German!) Auf Und Nieder, Botropper Bier Schützenliesel. Anneliese, Auf Wiederseh’n. SCHNAPS DAS WAR SEIN LETZTES WORT,Frau Meyer hat gelbe Unterhosen an. There are instructions for the Chicken Dance as well as notation. We have also provided essential recipes and instructions for celebrating Oktoberfest. Learn how to make proper Bratwurst, Potato Salad, and Gebrante Mandeln among other delicacies. Discover the origins of the Oktoberfest and learn how to drink bier and schnapps properly. Above all learn how you can take part in the tradition and save these important songs and customs for future generations. The booklet is a great gift for that "German" band that has forgotten the proper lyrics or for children and grand children who will feel much more comfortable at German events with the proper words for singing along. Hutman Productions is dedicated to the re-birth of folk customs. Therefore we offer this booklet at cost of production and publication with absolutely no profit. You just pay our costs and shipping. Order your copy today by filling out the form below. See our catalog web page to learn how you can order this booklet via paypal.